Prosecutors and defense attorneys have it easy—all they have to do is to present the evidence and make arguments. It’s the judges who have the heavy lift: they are the ones who have to make the ultimate decisions, many of which have profound consequences on the lives of the people standing in front of them. Relatively few judges have publicly shared the thought processes behind their decision making. 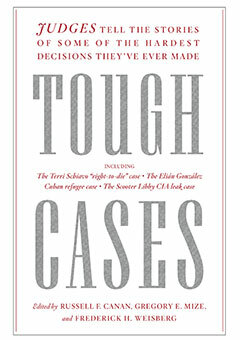 Tough Cases makes for fascinating reading for everyone from armchair attorneys and fans of Law and Order to those actively involved in the legal profession who want insight into the people judging their work. Russell F. Canan is currently a judge on the Superior Court of the District of Columbia and an adjunct professor at the George Washington University School of Law. He lives in Washington, DC. Frederick H. Weisberg is currently a judge on the Superior Court of the District of Columbia and teaches annually in the Trial Advocacy Workshop at Harvard Law School. He lives in Washington, DC.